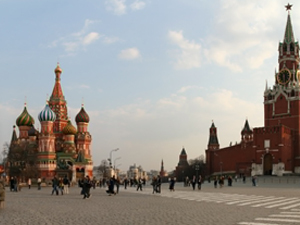 Unprecedented because it involved meeting not only with other Russian Orthodox living in America, and with Catholics, with whom the Russian Orthodox have long been in dialogue, but also with Protestant Evangelicals. 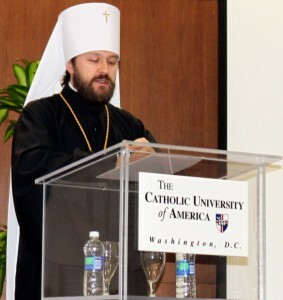 This was a dramatic new step in Hilarion’s long effort to forge what he calls an “alliance” between Christians in defense of traditional values while theological differences that continue to divide the Churches continue to be discussed in theological meetings. And Hilarion’s visit (which I was able to observe as part of his small entourage for most of the trip) was a remarkable triumph. There was not a false step during the entire visit. Indeed, it was an exhausting trip, and I noted that Hilarion, 44, now has a few white hairs he didn’t have a year or two ago. The trip began in New York with a lecture at St. Vladimir’s Orthodox Seminary and with the performance of his Passion According to St Matthew in a Catholic Church in New York. It ended in Dallas, at the heart of the “Bible Belt,” with an unprecented lecture at the Dallas Theological Seminary and a second performance of his Passion According to St. Matthew in the Highland Park Presbyterian Church, where he also delivered a homily (twice) at Sunday morning services.He even found time for an hour meeting with former US President George W. Bush. In fact, two Protestant Evangelicals who met with Hilarion, Janice Shaw Crouse and George Tryfiates, were so impressed with him that they wrote an article in which they referred to Hilarion as someone who has the potential to be a great leader for our time, and for the world’s Christians, because of his moral principles. No one has ever seen God, but the one and only Son, who is himself God and is in with the bosom of the Father, has made him known (John 1:18). These words have a truly profound and universal meaning. Indeed no human eyes have ever seen God the Father – the invisible God who has neither a physical body nor material form. But for people to strengthen their faith in God and to know that He not only exists in reality but also hears their prayers and is ready to come to their aid, the Father sent His Only-Begotten Son who became God incarnate and revealed to us His invisible Father. Only after the incarnation of the Word, when God became one of us, lived a human life, suffered and died on the cross, was raised from the dead to open for us the way to the Heavenly Kingdom and to raise us together with Himself, did human beings come to know God in the real sense. Before Christ’s coming, people did not know that God could become so close to them and be in full solidarity with them. They did not know that He loved human beings so much that He was ready to accept suffering and death for each one of us. He Himself bridged the abyss that separated us from Him – a chasm which we could never have overcome on our own. There is no clearer evidence of God’s love for humans than the cross on which God incarnate Himself was crucified. And there is no greater sacrifice that could have been offered by the Lord for the sake of humanity. But do we not we accept this, the greatest of Sacrifices, too easily? Have we not grown accustomed to it? Haven’t the shock and the confusion of this Sacrifice vanished from us because of our spiritual laziness? I have been crucified with Christ and I no longer live, but Christ lives in me (Gal. 2:19). This is the stance in life that has made the Church invincible throughout centuries and millennia notwithstanding the all-pervading enmity and temptations of the external world. We have been redeemed by His blood but we should also be His companions – co-travellers on His path to the cross. How dignified and sublime is this state of the spirit – the state in which the apostles, martyrs and all the saints dwelt. And how different it is from the petty inner world of modern man who, having lost all spiritual guidelines, has become a blind servant to his own passions and to the opinions of others. Humanity today is not only godless, it is also anti-human. Inhumanity, indifference towards the suffering of others, unwillingness to help or come forward for help, egocentrism and egoism have today reached truly universal dimensions. It is ever more difficult to meet a true human being in the desert of the modern world. Everywhere people live as though they will not be called to account for their sins, as though there is no God who set commandments, established laws and ordained moral rules for His people. Many live as if there is nothing beyond the threshold of death. They live only for themselves, for their own pleasure; they live to gratify their human lusts. Today we can state with deep consternation that the frontier of confrontation among the various Christian confessions lies not so much along lines of theological dispute, but rather in what hitherto seemed unthinkable, namely, marked differences among Christians in their understanding of moral law. A few decades ago disputes about what is sin and what is virtue were rare – after all, what was there to argue about? Everyone agreed that the Bible stated everything in absolutely clear terms. But now there has surfaced a desire to revise, or, to be more precise, to adjust the unambiguous commandments of God to any manifestation of human fancy: a trend that has spread out with the speed of a cancer. Ideological and ethical dividing lines have now come to lie not between believers and non-believers but actually within the community of those who call themselves Christians. This is even evident within one and the same confession. Recently, a few months ago addressing members of the Nicean Club of the Anglican Church, I noted that differences in views held by the liberal and conservative wings of that Church are greater than between Anglicans and adherents of other confessions. Never before has the world faced ethical problems of such severity as in our times. Technological progress has not alleviated the problem of moral choice but rather has exacerbated it. To the horror of thinkers and philosophers, the situation that emerged in the mid-20th century, when humanity proved capable of destroying not only itself but all life on earth, heralded a serious era of moral trials. Nuclear arms became the visible sign of force, and resources were set free by a human rationale not yet ready for such tests. In the light of fearful evidence, ongoing terrorist acts point to the existence of a dramatic tension between the sight poles of humanity. Having encountered naked aggression, social thinking has taken the easiest and therefore the worst-considered path. By exalting an all-pervasive pluralism of opinion and making it the foundation of a new world view, we not only fail completely to placate the acuteness of the conflict but instead increase the distance between the poles of confrontation. The faithful of various religions have at least one common quality, which is a commitment to principles, and in this they can find a place for mutual respect. But dialogue between a believer and a person void of principles is impossible. Between the two rests a misunderstanding that is neither religious nor ideological, but psychological and almost biological. Here lies the uttermost divergence of the poles. In order to cope with evil we ourselves must stand firmly on the side of goodness rather than that of abstract pluralism. But how is it possible to speak of a firm moral stand when the very foundations of morality are diluted – and that not without the approval of Christian leaders? Our task should be to unite the efforts of those Christians who hold fast to the Word of God without allowing any erosion of its moral imperatives to humour the spirit of the time. One explanation, but not the only one, is that Christianity preaches abstention, moderation and self-restriction. As such it clearly becomes an encumbrance that affects the rampant growth of consumerism on which today’s market economy is based. For this reason, there are many who wish to remove Christian ethics from social life. Circles with vested interests oppose the influence of Christian morality on the spheres of economy and business by subjecting everything to their principal market rule: ‘supply should forestall demand’. They also attempt to liberate the exploitation of human sexuality from any public control and above all to deprive Christian Churches of the right publicly to express concerns over this issue. In our disquiet over the preservation of Christian values, we should in the first place strive to be at one. Liberal tendencies in Protestant and Anglican communities present a challenge to Christians and Churches that have remained faithful to the evangelical principles that underlie doctrine, church order and ethics. We should then seek out allies to combat the destruction of Christianity’s very essence. Finally, we should defend Christian values against the challenges of secularism and relativism. The Lord has placed each of us in a particular life situation where we are surrounded by people at home, in the university, and at work. We must act among these people as apostles and preachers of Christ’s Truth. Christian spiritual and moral ideals should imbue our entire life. We should be Christians not only in church but also as a family, at work and in every place where people meet us. We should never impose the Christian faith on anybody; no-one can be forced to believe in God. But at the same time we ought to live in such a way that people may be inspired by our example. Authentic religious life begins not when we provide rational answers to questions of God’s existence but when we begin building our lives in accordance with God’s commandments. I invoke God’s blessing on all of you who have assembled here. The Passion CD and DVD are of the concert performed in Rome on March 29, 2007, in Russian with English subtitles. The Christmas Oratorio was performed on December 17, 2007, at the Basilica of the National Shrine of the Immaculate Conception in Washington, DC, also in Russian with English sub-titles. The music is by Russian Orthodox Metropolitan Hilarion Alfeyev, 44, head of the External Relations Department of the Russian Orthodox Church.